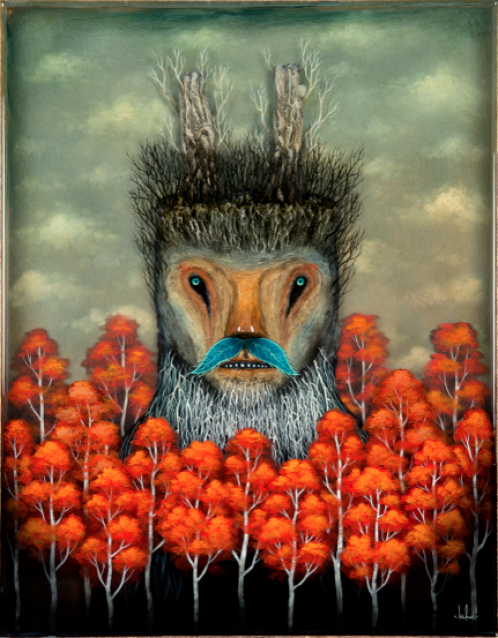 Known for human-animal hybrid figures set in forested backgrounds, Andy Kehoe’s recent works have evolved to include a new technique of painting his distinct imagery in oil and acrylic on multiple layers of resin. Incorporating this new medium has added illusions of shadow and dimension, altering spatial relationships from background to foreground and expanding the level of depth between subjects and their surrounding environment. 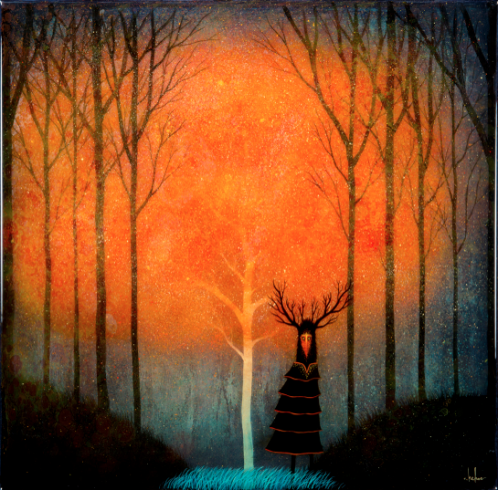 The show title Luminous Reverie, alludes to the idea of experiencing clarity of vision when lost in a daydream. It is also a reference to the radiant use of light throughout the imagery. There is a heightened ethereal quality to this body of work. Many of the figures are silhouetted, glowing and ghost-like or darkened, cast in shadow. Marbleized textures in the night skies are punctuated with stars and celestial bodies. Clouds, fogs and mists lend a sense of mystery to the atmosphere. Overall, the narratives have become more abstract, capturing moments in time as poetic fragments rather than full stories. Loaded with a greater sense of drama and emotion, the fantastical scenarios are pushed beyond the bounds of fantasy into a looser realm of the unimagined rather than the imagined.